What is Factory Reset Protection (FRP)? FRP is a protection and safety feature to prevent thieves from using a stolen or lost device even if they try to hard reset the phone to factory settings or even flash it. FRP works only when you’re signed into your Google account and then if someone tries to hard reset your phone through recovery mode, they are required to enter the Google account details, i.e. 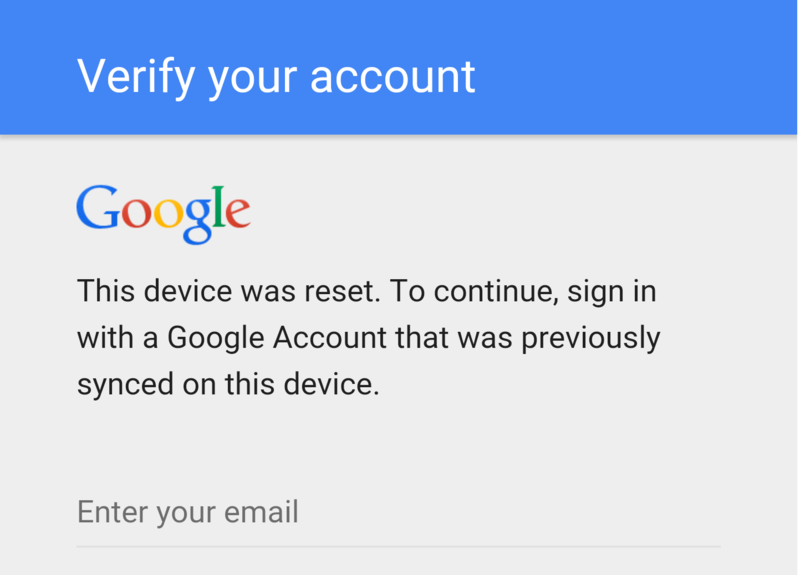 email and password from the last registered Google Account on that device to regain access. This means the person won’t be able to use the device freely unless he enters the correct credentials. To utilize the FRP feature, one must have a Google account setup on their device and it’s recommended to use a secure screen lock so that the intruder doesn’t have the choice to factory reset the phone using the general ‘Backup and reset’ option in settings. Moreover, it’s advisable to remove your Google account before handing your device to a service center for repair. Somehow, if you’re stuck in a situation where you’ve forgot your Google account password and want to get into the device then Rootjunky has got you covered! Rootjunky has earlier managed to figure out various ways to bypass FRP on Samsung devices, LG devices, Nexus devices such as 6P, 5X, Motorola Droid Turbo, etc. and you can refer to his YouTube channel for such video tutorials. He even figured out a way to bypass factory reset protection on Nexus 6P running Android N developer preview. It’s unsure if that method is limited to 6P or works will other phones running Android N as well. The process involves a series of complicated steps which are rather easy if one follows them step-by-step as stated. Coming to the point, RootJunky has now discovered a workaround to Bypass FRP on Samsung Galaxy S7 that ships with Android 6.0.1 Marshmallow. The trick is supposed to work both on S7 and S7 edge irrespective of their variants, i.e. Snapdragon or Exynos. The process involves over 40 steps but gets the job done in a few minutes without requiring a computer or technical skills. Watch the video tutorial below and simultaneously perform each step on your device to get over FRP on your Galaxy S7 & S7 edge. This bypassing FRP trick is indeed interesting but bothersome at the same time as it could potentially allow a thief to gain unauthorized access to your smartphone by simply following the above steps. Though, Google releases security updates monthly to fix such vulnerabilities but what if you don’t have the update and the issue remains unpatched. So, make sure your device has the latest software update installed. Disclaimer: This article is for informational and educational purposes only. We DO NOT endorse or encourage any kind of illegal activity. Recently i have purchased S7 edge. I want to root S7 edge smartphone. Have you any short method for rooting this..?? sorry, but this does not work anymore. the is no button which i can press and crome will open. I am having the same issue- did anyone come up with an alternative? Mine does not have the share feature it says its been blocked disabled or removed from device also mine is through at&t and the terms of service is different from yours it doesnt load i have to click on the indication bar in the middle that says terms of service while its trying to load it allows me to go into the net but does not allow me to type it doesnt even bring up my keyboard i was able to copy and paste my email and password and am signed in but the device will not sync the email to the device what can i do?